This stoic, rugged oak has been utilized and cherished by humans for a long time- as implied by it's name, Cork Oak has been a valuable resource for many years. 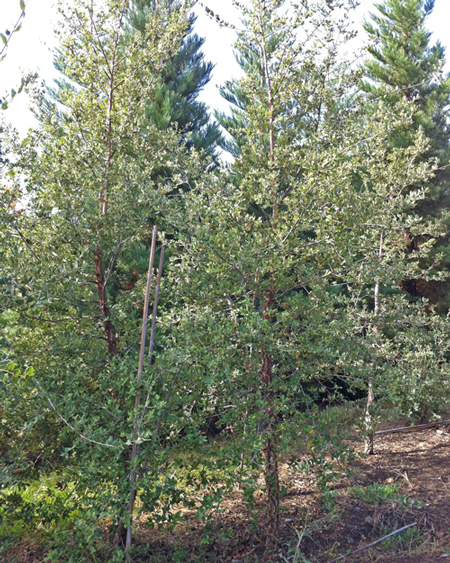 Ornamentally, its unique form with coarse, craggy bark and tough, leathery leaves make it a wonderful choice for a specimen and shade tree, where space permits. This tree can reach up to 40 feet tall with an equal spread. The dark tough, dark green leaves have leaf margins that range from shallowly lobed to toothed. Thick, craggy bark contains high levels of suberin and can be harvested every 9 to 12 years to produce cork. The trees have been considered to be soil builders, and the fruits and foliage have been shown to contain insecticidal properties. Plant in full sun, where they prefer moist, well drained soils but are adaptable to a variety of soil types. Drought tolerance makes them suitable for xeriscaping.